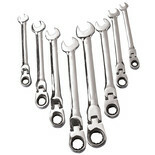 This six piece JUMBO Combination Spanner set is manufactured in Chrome Vanadium to DIN 3113A standard and is finished in chrome plate. 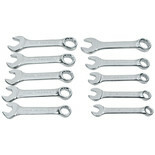 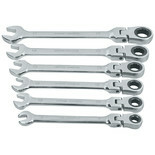 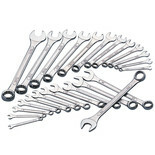 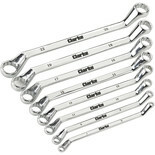 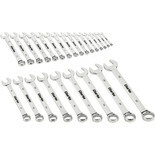 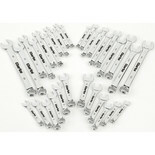 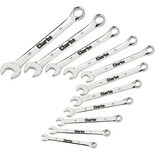 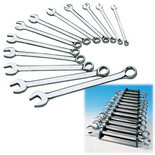 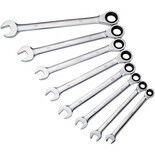 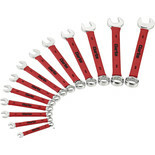 8 piece deep offset metric ring spanner set - Set consists of 8 metric spanners each with a deep offset to aid access. 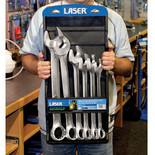 Sizes cover the most common requirements in automotive repair. 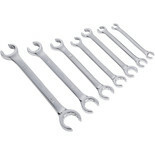 14 Piece cushion grip combination spanner set: 6-32mm - Cushion grip for comfortable use and mirror polished finish that prevents oil and grease adhering to the surface. 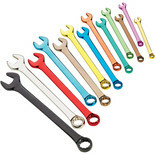 A set of 13 professional quality colour coded metric combination spanners supplied in a convenient wall mountable storage rack. 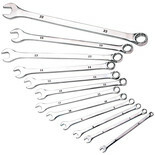 12 Piece extra-long combination spanner set: 6-22mm - Extra-long set with mirror polished chrome plated finish that prevents oil and grease adhering to the surface.